The Lodge is described as "One of the outstanding town houses of Elgin" Located in a quiet conservation area, and is only a 5 minute walk from the Town Centre and the Railway Station. We have a variety of bedrooms, all with warmth and comfort in mind to make you feel special. Breakfasts can be a feast or just a little taste, whatever the choice we only use the best of local produce. We cater for, Bedrooms: 4 Single. 2 Twin. 1 Family. 1 Double Bedrooms. Shower-room are all en-suite. 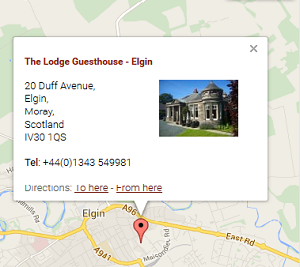 We are located near the centre of Elgin, for more information on how to find us, see our location page. The lodge was built for a tea-planter returning home to retire and is set in a large mature garden.